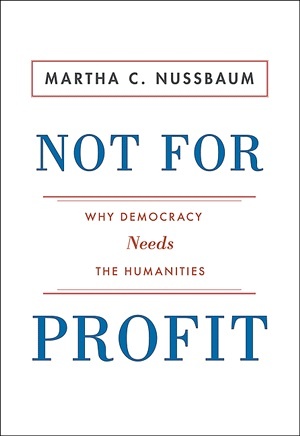 In India, where she has conducted research, and in the United States, where she teaches, Martha C. Nussbaum finds increasing emphasis being placed on the skills required by any modern democracy to sustain “a strong economy and a flourishing business culture”—but at the expense of humanistic education to “promote a climate of responsible and watchful stewardship and a culture of creative innovation,” as spelled out in this excerpt from the first chapter of Not for Profit: Why Democracy Needs the Humanities (Princeton, $22.95). Nussbaum, JF ’74, Ph.D. ’75, RI ’81, is Freund Distinguished Service Professor of law and ethics in the University of Chicago’s philosophy department and in its law and divinity schools. Radical changes are occurring in what democratic societies teach the young, and these changes have not been well thought through. Thirsty for national profit, nations, and their systems of education, are heedlessly discarding skills that are needed to keep democracies alive. If this trend continues, nations all over the world will soon be producing generations of useful machines, rather than complete citizens who can think for themselves, criticize tradition, and understand the significance of another person’s sufferings and achievements. The future of the world’s democracies hangs in the balance. What are these radical changes? The humanities and the arts are being cut away, in both primary/secondary and college/university education, in virtually every nation of the world. Seen by policy-makers as useless frills,…they are rapidly losing their place in curricula, and also in the minds and hearts of parents and children. Indeed, what we might call the humanistic aspects of science and social science—the imaginative, creative aspect, and the aspect of rigorous critical thought—are also losing ground as nations prefer to pursue short-term profit by the cultivation of the useful and highly applied skills suited to profit-making. …We are pursuing the possessions that protect, please, and comfort us—what [Rabindranath] Tagore called our material “covering.” But we seem to be forgetting about the soul, about what it is for thought to open out of the soul and connect person to world in a rich, subtle, and complicated manner; about what it is to approach another person as a soul, rather than as a mere useful instrument or an obstacle to one’s own plans; about what it is to talk as someone who has a soul to someone else whom one sees as similarly deep and complex. The word “soul” has religious connotations for many people, and I neither insist on these nor reject them. …What I do insist on, however, is what both Tagore and [Bronson] Alcott meant by this word: the faculties of thought and imagination that make us human and make our relationships rich human relationships, rather than relationships of mere use and manipulation. When we meet in society, if we have not learned to see both self and other in that way,…democracy is bound to fail, because democracy is built upon respect and concern, and these in turn are built upon the ability to see other people as human beings, not simply as objects. Given that economic growth is so eagerly sought by all nations, especially at this time of crisis, too few questions have been posed about the direction of education, and, with it, of the world’s democratic societies. With the rush to profitability in the global market, values precious for the future of democracy, especially in an era of religious and economic anxiety, are in danger of getting lost.